Amulet from India, Anonymous. No date. Photo: John Bigelow Taylor. NEW YORK, NY.- This February, the Museum of Arts and Design will present a major exhibition of global jewelry drawn exclusively from the unparalleled collection of Daniel and Serga Nadler, which was pledged as a promised gift to the Museum last year. This special exhibition will showcase approximately 150 masterpieces from Northern Africa, the Indian Subcontinent, and the Hill Tribes of Southeast Asia, including massive neck ornaments, ankle bracelets, and intricately crafted earrings. More than just decoration, these works in silver are also as direct reflections of wealth and social rank among these various peoples. The treasuries, often dowries, provide security for a woman as they can be sold or traded when extra money is needed. Encompassing more than 800 works in silver, the Nadler Collection is one of the most comprehensive holdings of tribal, ethnic, and contemporary jewelry in the world. On view from February 16 through August 8, 2010, Portable Treasuries: Silver Jewelry From The Nadler Collection marks the first time that works from the Nadler Collection will be on comprehensive display at the Museum. The exhibition will be presented in MADs Tiffany & Co. Foundation Jewelry Gallery, a groundbreaking facility dedicated to the study and presentation of jewelry.  A pair of elegant earrings from the Shekavati region, Rajasthan, India, each weighting almost 2 pounds. Traditional jewelry in India conveys the marital status of a woman, and wedding agreements often include the total weight of precious metals to be given to the bride. Customarily, the wedding dowry is the only personal asset that an Indian woman has and that she can keep even after a divorce.  A massive coiled neck torque from the Miao culture of Southeast Asia that weighs nearly 3 pounds. Silver is a traditional Miao symbol of wealth and Miao women donned silver necklaces as early as the Ming Dynasty. The precious metal pieces are savings accounts, serve as the Miaos banking system and families often store their wealth in womens jewelry. Each of the various groups has jewelry of distinctive styles and forms that also represents their identity.  A beautifully crafted necklace from the North African city of Taroudant, Morocco, made of engraved silver discs, amber, beads, shells and coral. 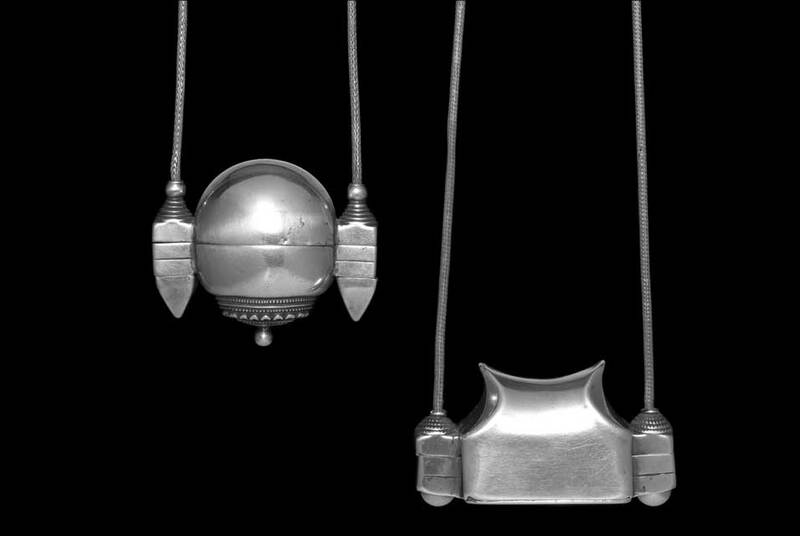 Women traditionally receive such necklaces from their future husbands and the jewelry represents financial stability, social status and the tribes affiliations. The value of the necklace is dependant on the size of amber and copal beads. Daniel Nadler was born in Egypt of European parents. He graduated from Cornell University as a civil engineer and spent most of his career in construction, which gave him the opportunity to travel throughout the world. While working in Iran, he met Serga, who was born in Tehran to Armenian and German parents. Today, Mrs. Nadler is an active volunteer docent at the Metropolitan Museum of Art in New York. The Nadler acquired their silver jewelry collection over the course of 30 years on expeditions to such countries as Egypt, Morocco, Greece, India, Indonesia, Burma, Thailand, China, Mexico, and the Western United States. The collection, which was pledged as a promised gift to MAD, features more than 800 superbly designed and crafted body ornaments of silver. Both Nadlers are accomplished photographers, as well as authors. Together the couple has written Silver: From Fetish to Fashion, which features personal commentary and photographs of the universe of silver adornments and beads. This book includes illustrations of many of the jewels from their collection, as displayed by their original wearers. Silver: From Fetish to Fashion is available for purchase at the MAD Store. In addition, Mr. Nadler is the author and photographer of China to Order: Focusing on the 19th Century and Surveying Polychrome Porcelain Produced During the Qing Dynasty 1644-1908, a volume based on the couples extensive collection of Chinese Export porcelains. Mr. Nadler has also published Iran the Beautiful, which features his photographs from Iran, and Arathusa, which documents a safari in South Africa.